Braids have been around for a long time and it’s because they are a classically awesome style. They also happen to be a versatile style that you can wear anywhere. You can wear braids to the gym, for a hot day at the beach or you can dress it up for a wedding. These styles are incredible and they are definitely the kind of style that everyone loves. If you are looking for a classic style that is one of kind, then you can never go wrong with braids. They are just that awesome. There are so many different braided styles to chose from and we are going to show them to you. 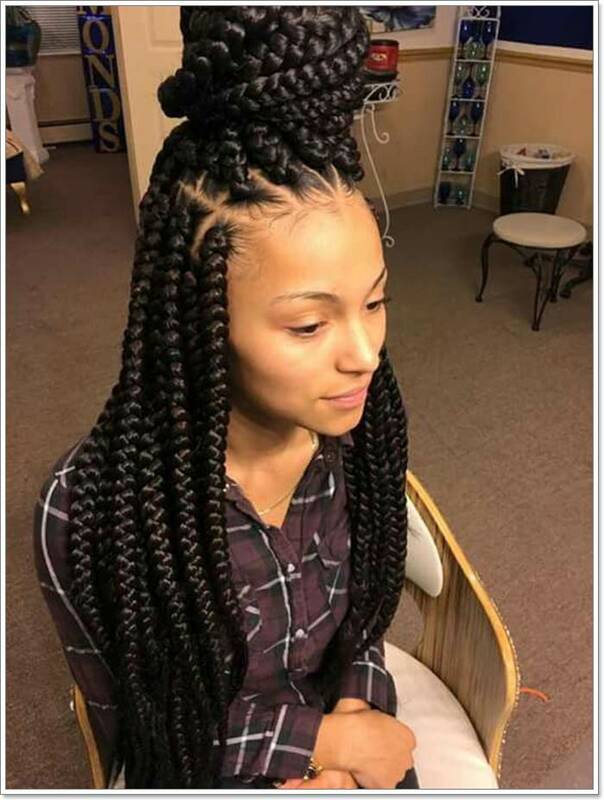 By the time you have finished the article you will know everything there is to know about braids and we will also provide tips on how to get the best braids for yourself. There are a ton of different braids to choose from that will put a smile on your face. We have a ton of examples that will allow you to determine what kind of braid you are looking for. You may even learn about some braids you have never heard about before. There are many purposes for braids such as convenience, trendy styles or even creating a low-maintenance for yourself. Here are a few braided styles that we are pretty proud of. If you need to go to the gym and you want to keep your hair out of your face, then this is the best look that you can go with. A 3-strand braid will keep your hair put together and out of the way. It’s one of the most basic braids that you could ever try out and it’s usually the kind that people use for casual days, not to mention it is so easy to put together. At one point or another, we have all probably used this type of braid, especially growing up. It’s an easy hairstyle for parents to use with their kids because it keeps hair out of their kids’ faces and it literally takes under a minute to create. It is probably also the first hairstyle that we as children learned how to do on our own. If you were part of the Girl Guides growing up, then you probably learned how to braid at that point. This basic braid is one braid that you can literally create hundreds of hairstyles with. These basic braids can also be added to more complex styles to create something truly magical. These basic braids can also come in many sizes, it all depends on the type of style that you are looking for. Make sure you give your hair a good brushing so that you don’t have any tangles before you start. Divide your hair into three sections. Braiding begins and you start by flipping the left section over the middle section. Begin again with the right section and flip it over the middle section. Continue steps 3 and 4 by going back and forth from left to right until the braid is complete. Secure the end with an elastic. Now, the French Braid is one of the most classic styles and it has been around forever. It’s usually the hairstyle that our mothers used to use when getting us ready for school or church. It’s a stunning style that is tight and keeps every hair in place. If you need your hair out of your face, then this is a chic way to do it. The French Braid does take some practice but once you have it down pat, it will likely take you about 3 minutes to create. Again, it’s best to start by brushing out your hair so that there are no tangles. There is a front section of your hair between your temples. Pick up that section and divide it into 3 sections. Braid it in a stitch. Continue braiding until your braid gets to the nape of your neck. At this point, you will have run out of hair to add from either side. Then continue to braid the rest of the way down and then secure the hair with an elastic. If you are looking for some more volume. Just tug apart the braid a little. By loosening it you can give yourself more volume. What Happens If You Can’t Braid? Sometimes braiding can come easily for some people. They seem to pick up the knack for it pretty easily. But not everyone is like that. For some people, braiding is really hard. So how can you take advantage of all the cool styles if you can’t even braid your own hair? For some of the complicated braid styles, it’s always best to go to a stylist but you wouldn’t want to have to do that with the basic styles. We would definitely recommend to practice a lot. You won’t always pick up a braided style right away, sometimes it takes doing it a few times before it will come together for you. We have some tips for you to create the best braids that you could ever have. You may not have even thought of using products for a braid but sometimes it could be the best possible thing to use to make braiding easier. If you are styling any type of box braids, you need to use serum for the best results. Some people don’t think that they can have that fantastic fishtail look with curly hair but that’s just not true. You just need to work with the texture that you have. We have a great tip for side-braiding from Mia Santiago that will make things a lot easier for you. “If you’re doing a braid that will go down one side, use a clip to move all of your hair,” she said. “It will keep everything tight and prevent your fingers from slipping.” Make sure to leave the clip in during the braiding process. The fishtail braid is one of the most elegant and magical braids that you can ever have. It’s an amazing style and one that you could easily take to a fancy event. It’s a romantic style that was often used in the medieval days with royalty. That’s because it looks so incredibly beautiful. This style is one of the most intricate braids that you can have. It’s a favorite because of the way it looks and a lot of people love the loose and messy style that can be created from it. When it comes to weddings or formal events, the fishtail is one of the most popular types of braids that you can use for an event like that. The idea of the Fishtail braid is that it involves weaving delicate and thin sections of hair together to create a symmetrical effect that looks just like a fish’s tail. It’s gorgeous and we love it! Once again, brush your hair thoroughly so that there are no tangles. Take your hair and gather it into a ponytail. Take the ponytail and divide it into 2 equal sections. You are going to do the same thing on the outer side of the right section. Make sure to flip it over and then add it to the inner side of the left section of the ponytail. Continue to repeat steps 4 and 5 back and forth until the braid is finished. Cut the elastic you used to secure the ponytail in order to finish off the fishtail look. You might think that the French braid looks a lot like a French braid and you would be right. Essentially a Dutch Braid is just like a French Braid except it is done in reverse. It allows for some awesome dimension because of how it sits on your head. It can be done two different ways: It can be styled with a bun so that you can wear it to work or it can be done in a half up style if you are looking to go out on the town with it. Take the brush and make sure that you take all the tangles from your hair. Just like you would do with the French Braid, you take the front section between the temples and divide it into 3 sections. Start braiding the first stitch by flipping the side sections underneath the middle section. For each stitch of the braid, you want to continue to add hair from outside of the braid from the sides before you flip them under the middle section. With the Dutch Braid, you will continue braiding until you get to the nape of the neck. At that point, you will run out of hair that you can bring in from the sides. Simply continue to braid the hair until you get to the end and secure it with an elastic. This is another braid that is really easy to create because it’s just one step up from the basic 3 strand braid. This is the kind of braid that you use when you want to punch up your look from the standard braid. If you are bored with the look you have been using so far, then the 4-strand braid would be a nice change for you. It’s another casual style that you can wear anywhere because it’s more of a casual look. You can wear it to work, school or to the gym. 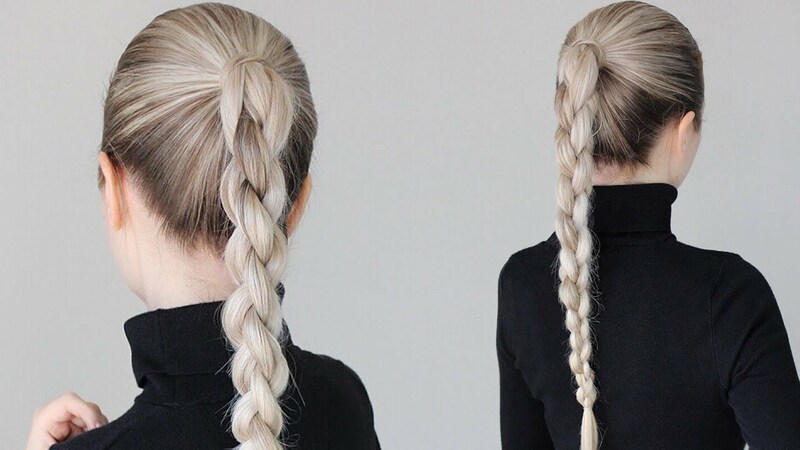 At first glance, it may look like a regular braid but people will likely do a double take when they realize that it’s a little different. Start off by brushing your hair to make sure that there are no tangles before you get started. You want to part your hair down the middle and then brush the hair back. You are going to divide your hair into 4 equal sections and try to remember them as 1, 2, 3, 4. Start the braiding process by flipping section 1 under section 2 and then over section 3. After you have done that, you will then flip 4 over section 3 and under section 4. Now you are going to have to renumber the sections as 1, 2, 3, 4 and then once again follow the over under-over-over-under pattern over and over again until the braid is complete. This is a cool looking braid that essentially looks like a rope. It’s one of the easiest braids that you can create yourself and it doesn’t take long at all to do. All you have to do is twist 2 sections of hair together to create the look so it takes about 2 minutes to put together. If you need a quit look that takes no time at all to create, then this is the look for you. Brush out all the tangles from your hair and then tie the hair up into a high ponytail. Divide that ponytail into 2 sections. Take those two sections and twist them in a clockwise direction until the end. Then you are going to intertwine these twisted sections with each other to create the rope braid in an anticlockwise direction until the end. 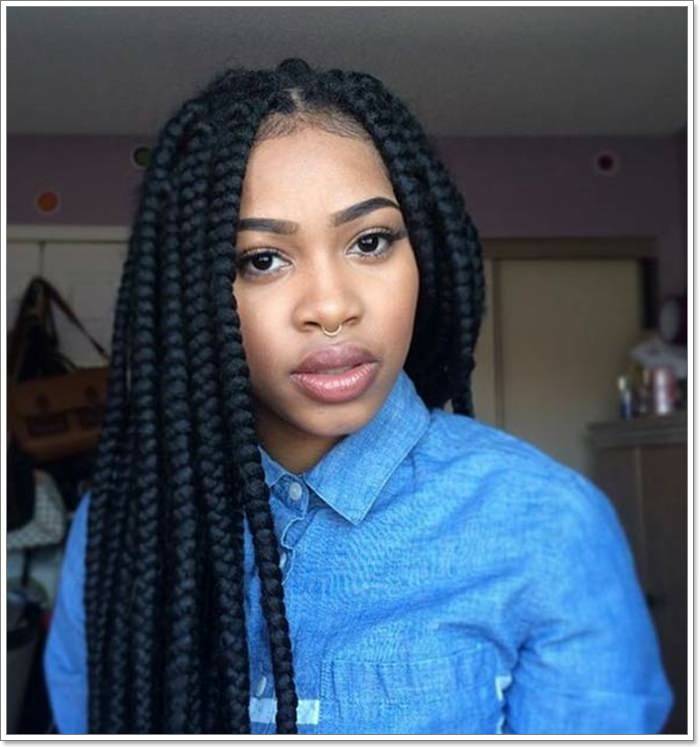 Box braids are another style that has been around forever and most people get them because it’s a low-maintenance style that they can keep in for a couple of months at a time. It’s convenient and it allows them to have a style that they don’t have to worry about. 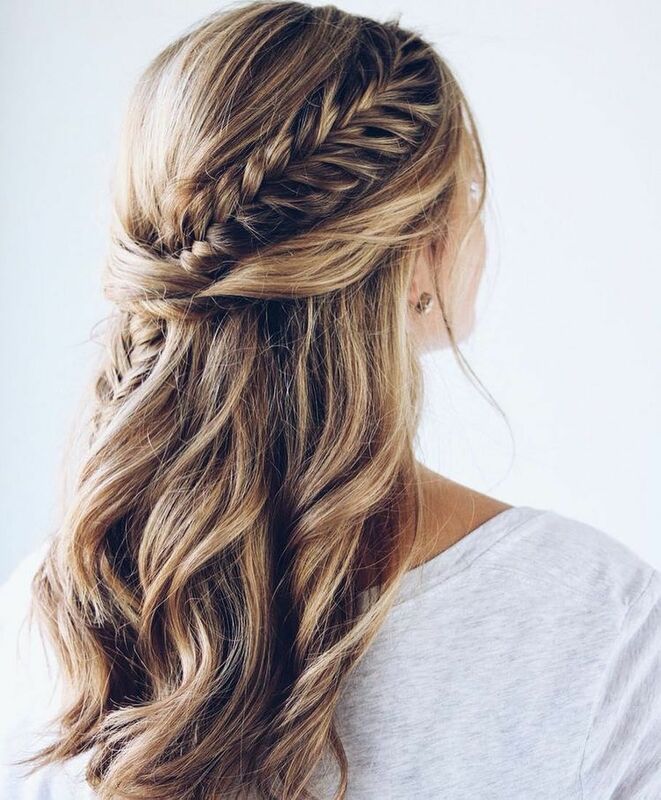 You don’t have to brush or even wash this type of braid every day which is why it’s such an appealing style. Celebrities like Kim Kardashian, Beyoncé and Zoe Kravitz love these styles and will often bring them on the red carpet. This is not a style that you would do yourself. 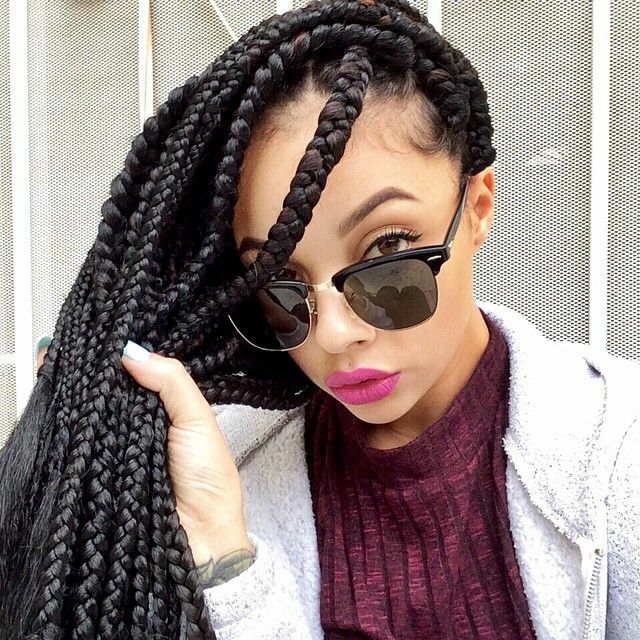 It’s always best to go to a professional that has some experience with box braids. You will probably want to bring a coffee and a good book because it usually takes several hours to create a look like this. If you have a lot of hair, that’s great it can be done with your own natural hair. But if you don’t, no worries, the stylist can weave in hair pieces. That will, of course, change the price of the style. It usually costs at least a $100-200 for just the box braids themselves to be created, adding more hair in will change the price. Who Should Get The Style? Anyone who wants a low-maintenance look and it can be done on any texture of hair. How Do You Make Them Last? These types of braids can be kept in your hair for months, it all depends on how you take care of them. The best thing you can do to make sure that they last longer, is to make sure that they start off as nice and tight at the root. You don’t want to be uncomfortable but just make sure that they are tight enough that they won’t start to fray or unravel. 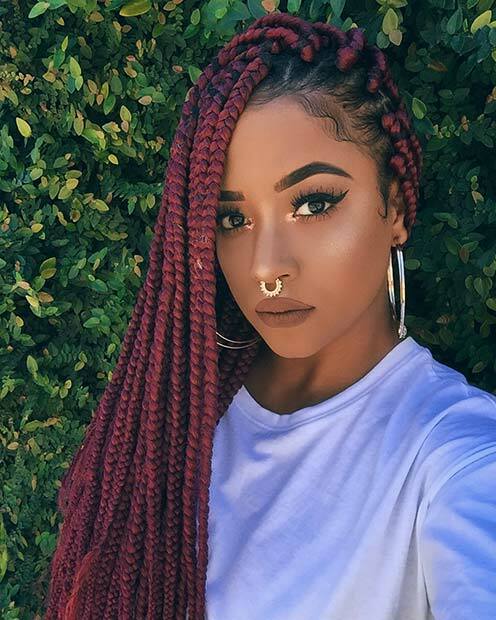 You have to take care of your braids if you expect them to last a long time but there isn’t even a lot of work involved when it comes to box braids. When you are styling your braid, just try not to pull on them too tightly. When you are sleeping, try to use a silk pillowcase if you can. It’s so comfortable anyway, so why not use one if you can. You also have to be careful with using a lot of products on your hair during this time because you can end up with a lot of buildup after a while. Make sure you are shampooing your hair, but just don’t do it very often. If you are someone that likes to manipulate your hair a lot you could end up with a lot of flyaways. So try not to play around with your braids too much. If you really love the style and you want to keep it in for longer than a couple of months, it will require you to go back and get it rebraided. Some people do this themselves but we always recommend going to a salon unless you really know what you are doing. So, when is a good time to do this? Well, it all depends on how long you want to keep them in. Rebraiding can occur after a few weeks or a few months. The process of removing the braids can be a tedious process so if you are doing it yourself, make sure you have someone to help or just go back to the salon where you had it done, and have them do it. Always start at the bottom and begin unbraiding your hair by using a comb. This allows you to detangle your real hair from the extensions without causing a ton of tangles. Some stylists will use flame to bind synthetic hair with real hair at the bottom to keep it all together. If that was the case, then you will need to cut the ends of your hair before you can begin to unbraid the hair. We hope that you enjoyed the article on braids and came away with some inspiration for your own hair. There are so many different styles to chose from when it comes to braids and it would be fun to try them all. These are great examples that you can try and try again. When it comes to braids, they never go out of style, so you are open to keep trying. Previous article50+ Foxy Hipster Outfits: Which Combination Are You?